"This is a delicious Recipe which my late father left to me. Everyone raves about this recipe, and it is sooooo...easy. Wonderful side dish with pork chops." In a food processor grate potatoes and onion. In a large bowl combine potatoes, onions, eggs, pancake mix, salt and pepper. Heat oil in a large skillet over medium heat. Spoon potatoes into skillet and cook as you would pancakes, for 3 to 4 minutes on each side. See how to make simple, traditional potato pancakes. Just tried this recipe for the first time. 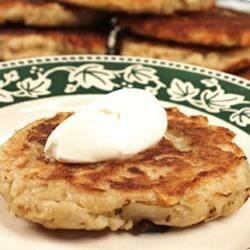 I have never found a potato pancake recipe that I liked 'til this one! It's excellent! My "picky eaters" ate all I made and asked for more. Thank you. This recipe was very dry and gluey. Not even my husband would eat them and he likes everything. My picky husband really liked these alot! I've been looking for a recipe that he'd like for a long time- Thanks! I just made these tonight for dinner. I have never had potato pancakes before and this recipe was great! They came out so awsome, my family loved them. They were easy to make and taste great! I gave this a 4 rating because they turned out dry and floury. I think with about 1 cup less flour, this recipe will be a 5 star for me! They had a good flavor sprinkled with parmesan cheese. These potato pancakes are so good! Make sure to use the whole batter and not save any for later. My unused batter turned black after a few hours in the fridge. This is a great recipe! It inspied me to use grated zucchini instead of potato and wow...yum!!! Thanks! This is excellent. However, it could use a little more salt, but that's just my opinion. Sour cream goes great with it!